A body camera on a Methuen police officer. Halfway into a six-month test of body-worn cameras, Boston police say the 100 officers assigned the cameras have generated more than 10,000 unique videos representing nearly 1,500 hours of footage. They also have documented 72 camera recording failures, department spokesman Michael McCarthy said Friday. He attributed those to technical malfunctions such as insufficient battery life, or cameras falling off their mounts or shutting off without explanation. There have been no complaints or misconduct investigations related to use of the cameras, McCarthy added. He said officers are ‘‘close to’’ 100 percent compliant in using the cameras during interactions that should be recorded, based on random audits. The 10,422 videos captured so far amount to 1,472 hours and 1.6 terabytes of data, he said. The pilot has been averaging 114 videos a day, with videos averaging about 8.5 minutes. McCarthy provided the updates after requests for complaints, investigations, audits, budgets, and other documents related to the program went largely unanswered during the past month. He didn’t provide copies of documents such as the program budget or audit reports as AP requested. He also didn’t say how usage or malfunctioning data compared to the department’s expectations going into the test. ‘‘Precisely why we are conducting a pilot,’’ McCarthy said. Civil rights groups this week had voiced concerns about transparency as the pilot effort reached its halfway mark. And a study intended to assess the six-month pilot, launched Sept. 12, has not been fully funded and not begun in earnest, researchers said this week. Jack McDevitt, director of Northeastern University’s Institute on Race and Justice, which has signed on to conduct the study, said his team still has not secured all the money needed for the work. The study isn’t being paid by the university or police, which says it has spent nearly $85,000 of a roughly $500,000 budget for the effort. Researchers have so far received $34,900 from police and another $10,000 from the Rappaport Institute for Greater Boston, said Anthony Braga, McDevitt’s colleague at Northeastern, in an e-mail late Friday. An application for funding from another foundation was rejected, he added. Michael Curry, outgoing president of the Boston chapter of the NAACP, said the city should have found other ways to pay for the study, which police said was a critical piece as they weigh a department-wide rollout of the cameras. ‘‘The clear sign when someone is not committed to doing something is when they come up with too many excuses,’’ he said. If and when Northeastern receives full funding, McDevitt said, the plan is to review citizen complaints and department data on officer activity and workload. Researchers will also compare the costs for the two types of cameras being tested and host focus groups with officers and community organizations. 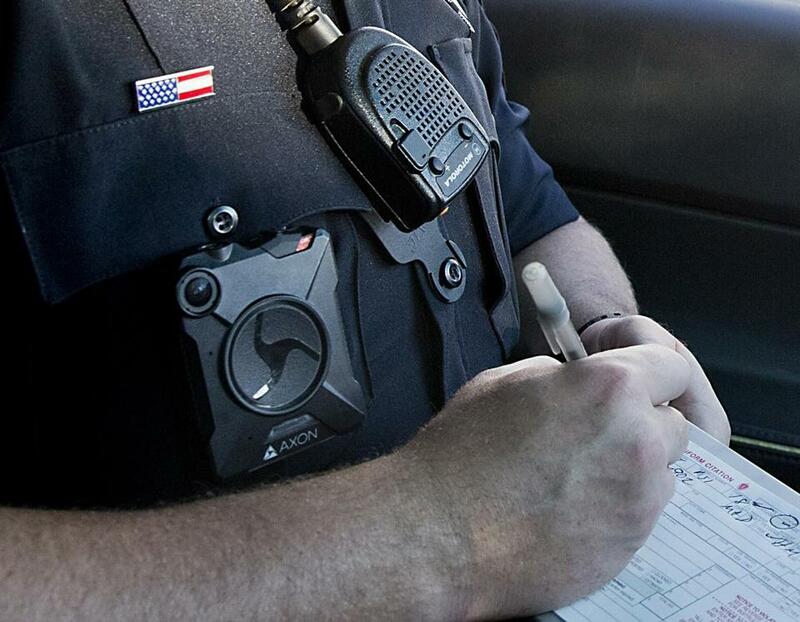 Most large and mid-size cities with some form of a body camera program haven’t been forthcoming once their programs are underway, said Harlan Yu, a principal at Upturn, a consulting firm working with civil rights groups to study police body camera programs. One exception is Washington, D.C., where the law requires police to release a report twice a year about body camera usage, he said. Boston community leaders say they’ve heard few complaints or problems so far from residents or officers. But the shooting by police of an emotionally disturbed man in October underscores the need for wider use of body cameras, they say. None of the officers involved in that shooting, which prosecutors are reviewing, had been assigned a body camera. Police maintain 31-year-old Terrence Coleman was shot after lunging at them and emergency medical technicians with a knife. But Coleman’s mother, who had called for the assistance, says her son was unarmed when police burst through the door and shot him.